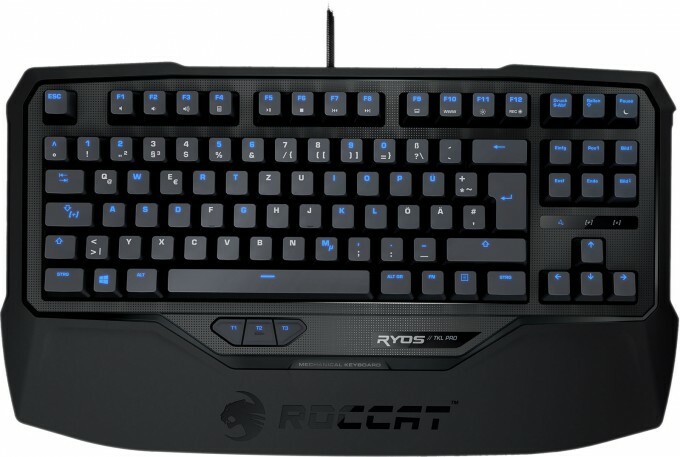 With its Ryos TKL Pro, ROCCAT aims to give gamers a feature-packed keyboard that gives them the ultimate gaming experience. We’ve heard that before, but most gaming keyboards don’t pack in the sheer number of features that this has. Unless you’re a gamer who needs a numpad, this keyboard is worth checking out. ROCCAT is a well-known contender in the gaming peripherals market, always looking to redefine a market niche. Today we are looking at a tenkeyless keyboard, the Ryos TKL Pro. This is a mechanical gamer’s keyboard featuring individual key backlighting and programmable profiles. Keyboards are a very personal item, which make them a challenge to review. What some people think is fantastic may be annoying to others. It is my job as your friend and humble reviewer to describe this keyboard that I have personally been putting to the test at my job – which involves being on a keyboard all day. The ROCCAT Ryos TKL Pro is available with a variety of different mechanical switch flavors from CHERRY, the leading manufacturer of mechanical switches. This particular keyboard is equipped with MX Brown, which is considered by many to be the best overall mechanical switch available today. This keyboard is a little unassuming when you first look at it – plain black, clean lines, standard key layout, not too many frills – just a solid-looking keyboard. Right away I noticed the front of the keyboard where your wrists rest; on most of the keyboards that I have reviewed, this part has always been removable, to help accommodate whatever desk setup that you may have. On this keyboard however, that piece is permanently attached, and is really quite substantially made. It is thick and very solid feeling – I even found myself resting my forearms on it from time to time, and it just felt very solid – at least at first. On this wrist rest is where we find the three profile buttons; we will get to those in just a moment. On the underside of the keyboard, we find grooves through which you can route the cable, whether you want it to come out of the middle, left side, or right side of the back, or from the left or right-hand side, or even the left or right side of the front. There are also two flip-up feet that allow you to adjust the angle of the keyboard to suit your preferences. These feet feel very sturdy and well-made; several keyboards have had untimely retirements just because of broken feet. On each corner of the backside, you find large non-skid rubber pads, providing a nice grip on your desk, keeping your keyboard from walking all over your desk as you are trying to get work done (I hate that!). The cable on this keyboard is the standard woven-fiber style that we see on many gamers’ devices these days, and it’s a generous length. There’s no gold-plated hardware on this device, which anyone who knows electronics will tell you is nothing more than a marketing scheme, and is certainly not needed. Plus, it adds unnecessary cost to the devices that boast this feature. The cable is non-removable, something that I really like. The keys are really quite standard on this keyboard. The surface has a nice textured feel that ensures that your fingers are not sliding off and hitting the wrong keys as a result. One feature on this keyboard that isn’t necessarily standard equipment on mechanical gamer keyboards (you would think it would be) is individual key backlighting. This is a feature that’s almost universally available on most membrane style gamer keyboards, but is less common on mechanical keyboards. This keyboard feels like a seriously well-made piece of hardware when you pick it up. There is very little if any perceivable flex, and it just has a premium feel that’s hard to properly articulate into words. As I mentioned earlier, this keyboard features backlighting – but not just any standard backlighting like most keyboards where you can choose whether you want the lighting on or off, or select your level of brightness. This Ryos TKL PRO features “Lighting Engine 2.0”. What this means is that you can fully customize your lighting scheme (except for the color) using the accompanying software. You can add effects that make the lighting fade to your keystrokes, a splash effect, and many more. Personally, a lot of this is basically just fluff, and I am really only looking for brightness adjustment, which is easily done without the software. You can also configure your keyboard to highlight your in-game application key bindings, modifier keys, cool downs, macro sequences, system controls, and more. Using the accompanying software, you can control the lighting as I mentioned above, and also take advantage of myriad options when it comes to configuring keys. The Ryos TKL Pro features “Easy-Shift[+]” and FN keys; with this, you can assign secondary functions to almost every key on the keyboard, bringing a potentially game-changing advantage to your favorite games. The keyboard can store up to 470 different programmable macros in flash memory, and features two 32-bit processors to manage and control all of these features. Now onto the most difficult-to-articulate part of the review: how the keyboard types, feels, sounds… all that good stuff. I will start by saying that in general, I like the way it types. It has a very satisfying feel, and the responsiveness and sensitivity are certainly on par with other top-end keyboards that I have used. The one thing that was a little surprising about this, though, was how noisy these keys were. I know that all keyboard models are made different, but I didn’t figure that a keyboard with MX Brown switches would be this noisy. The noise is not coming from the switches, but from the keys themselves. They give a rather satisfying “clunk” sound when they bottom out. This may be something that you will like, or not – it just depends on your personal taste. The keyboard that I use at home is a Logitech model with the same MX Brown switches as the ROCCAT; it is really interesting how different the two feel. Common sense would dictate that if the actuation parts are identical, they should at least give you a similar experience when you are typing – this is certainly not the case. Now don’t get me wrong, this keyboard types really well. I have been using it every day for weeks now, and I really do like it. My fingers don’t get fatigued like they do on membrane style switches, and my co-workers don’t seem to mind the extra noise coming from my cubicle. This is not a noisy keyboard per se – if you want to hear a noisy keyboard, go check out something with the blue variety switches. Some people like the noise, some don’t – this is just something that you will have to decide for yourself. There are measures that you can take to try to reduce this noise, such as installing rubber o-rings on the keycaps. I really only have one complaint about this keyboard, and it really isn’t a big one: on the wrist rest, the plastic at the end of my sample has developed a creak when I apply pressure. It does require a decent amount of pressure to make this happen, so just normally resting your wrists on it will not be enough, but if you set your elbow on it, you may very well hear something. The noise was not there when I first got the keyboard, but after about 6 weeks of use, it developed this noise. Overall, this is a great keyboard, and I think that if you buy it you will not be disappointed. I did find a couple of things that I didn’t love about the keyboard as I mentioned above, but these were really minor. At a price point of about $140, it is priced in the higher-end of the tenkeyless gamer keyboard market, and I feel that is where it belongs. Backlighting is easily adjustable without software. Keys are on the noisy side. Price is a little high for a ten key-less board. Possible build quality issues with creaking on wrist rest.